Details make the scene come alive! WELCOME to the 16th issue of BYMRr-Zine - a newsletter published by Building Your Model Railroad, and devoted to providing breaking news and tips to model railroaders of all ages and all scales in a quick and easy-to-read format. Resources are always credited where appropriate. Send in Your Tips/Comments: Let me know if you have any tips to pass on to other model railroaders. Just type them in on the Comments Page of the website or send me an email directly to gregwarth@building-your-model-railroad.com. Red Earth Railway – Videos of a great model railroad can be found here, including "filmed" tutorials on how it was done. Funny and informative, the movies are entertaining as well as instructional. The instructor is a masterful and experienced scratch-builder as well and can show you some new methods he has developed that should help to improve your scratchbuilding skills. Whether you're a beginner or a seasoned scratch-buider there's something fun and interesting in this for you. ~ A great start to building a model railroad – Lots of information provided in a video format and much more entertaining than other standard tutorial videos that you've seen. ~ Ways to save lots of money as you build your railroad. ~ Learn how to use ordinary tools and an ordinary workshop to build something from nothing. You’ve no doubt heard about the cookie cutter method of building a model railroad layout in which the surface plywood is cut using a jigsaw such that parts of the surface can be elevated to a higher level to make mountains and grades. The track is Atlas code 80 – a combination of both sectional and flextrack. The plan is a folded dogbone surrounded by an oval, so that I can run 2 trains at once. Plastic railgaps have been inserted between the 2 turnouts in both the front and the back of the layout to avoid short circuits. (Don’t ask me how I knew to do this.) The entire inner mainline could be considered a reverse loop of sorts. If you follow the path of a train around, from the front rerailer on the inner loop, around the figure 8 and then connect to the outer loop again to the far side of the layout, the train will now be running in a reverse direction from where it started. Wiring is planned for DC but could be easily converted to DCC, depending on which transformer I decide to use and whether I want to invest in more expensive DCC-equipped locos for this small project. Actually, DCC might be better as I think about it, because most of the DCC power command units have automatic reversers in them, which would save me from having to do extra wiring and switches needed for the reverse loop. I’ve already checked the grades and my $39 DC loco that I just bought can carry two cars up the grade. If I add another loco, I can increase the train by 2 more cars and still make it up the grade fairly easily. I could carry more cars if I lower the grade, but I won’t be able to carry many more cars on this small layout anyway, since the runs are just not that long. The whole project is only 2x4 ft, so the curves are pretty sharp. I probably won’t be able to run modern passenger cars around those curves but anything in the 40 ft long category should be fine. The wads of newspaper are where my mountains will go. I’ll just cover them with plaster cloth and add ground goop, rocks, Sculptamold, paint and trees to finish the effect. Next month, I’ll show you the finished product. There's nothing like adding sound to make a layout more interesting and realistic. A great way to do this relatively inexpensively is to use a device called DreamPlayer offered by Pricom (www.pricom.com) – a nice and easy way to get sound for your layout. The unit sells for about $79USD and can play a variety of different sounds through a speaker or speakers mounted under or on your layout. You can also download different sounds from the Internet onto a flashdrive and load those sounds into the DreamPlayer for use on your layout. This is similar to what the now obsolete QSI Maxx Traxx sound system was all about. Pricom also offers a switcher device that can be coupled with the DreamPlayer to send four separate sounds to different parts of your layout. Check out the Pricom website for more information. 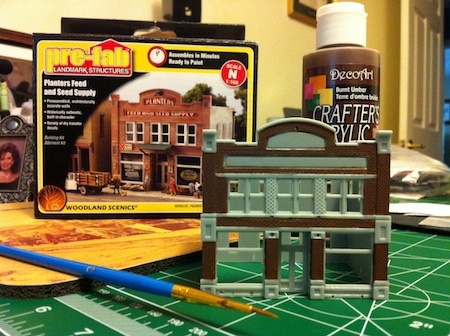 I decided to try out one of the new pre-fab Landmark Structures by Woodland Scenics – Planters Feed and Seed Supply. The main parts of the building – of course the parts that are the easiest to put together – were already assembled. But in truth there aren’t very many other parts to add on to the building after it’s painted and it seems pretty easy to assemble. The hardest part is painting it, which takes a lot of time and patience. Make sure you have a good quality fine-tipped brush for the job and a steady hand, especially if you’re working on N or Z-scaled structures. Use a digital SLR if you can, but in truth, a good quality point-and-shoot camera will work well for most of us. I took many of the photos that appear on the website with just my iPhone camera. Remember that when you take photos of your layout, use ambient lighting and try not to use flash, which usually makes everything look washed out and artificial. Also, try to bring your perspective down to nearly eye level. This will make the views much more realistic. Use filters on your camera for special effects like fog and star filters. Add wisps of cotton to simulate smoke. Use a photo backdrop if you have one to place your trains in the proper environment. A blue, flat board if that’s all you have, will look better than your workshop as a background. Consider placing your camera directly on the layout using a small tripod. Take the shot with the self-timer or remote shutter switch. This will get your camera right into where the action is and eliminate camera shake. If you have a good software editing program like Adobe or Corel, you can do a lot more with your pictures - editing exposure, contrast, brightness, cropping, using filters after the fact, adding smoke, or even adding a backdrop, or background blur to simulate speed. Helicon software can be used to correct for limited depth of field so that the near parts of your photo are as sharp as the far areas. 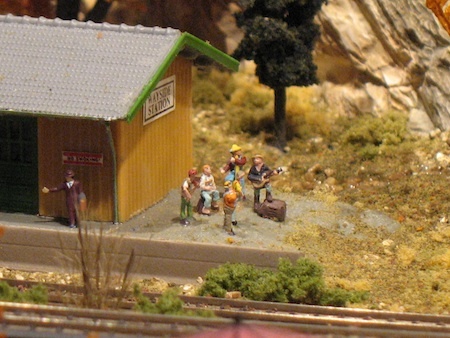 Get more tips on photographing your layout or diorama on the Photography page of the website. I've heard a lot about Kato Unitrack over the years, and I've seen it nicely displayed at train shows, but I've never actually used it for a layout. So recently at a local train show, I came across a Kato Unitrack vendor and was able to purchase, fairly reasonably, a package that consisted of an outer oval and an inner viaduct that in effect was a folded dogbone. I decided to give it a try. The base that I made for this consisted of a piece of 1/2 inch fiberboard 32 x 48 inches, which I covered with extruded foam sheeting, and then applied a vinyl grass mat. I am planning to make this layout into a city complex with one side being downtown and the other side being more rural and industrial. The directions that the vendor had provided were excellent and in one evening I had it all put together with trains up and running - almost too easy compared to what I'm used to - No roadbed to put down and glue in place first. No difficulty getting tracks to fit together. No flextrack issues. No sore thumbs putting in rail joiners. No soldering. No worrying about grades and radius measurements. The track connects together very securely, although the sections are not difficult to separate if you have to. The best thing about it is that derailments due to uneven track connections or turnout irregularities do not seem to be much of an issue at all. After setting up this layout, my trains run flawlessly without requiring any troubleshooting. The slow part of this layout will be making or buying the structures for it, adding lights, lamppost, lots of people, cars, trees, bushes and other details. It's all very clean and neat, which may appeal to some but not all. Currently I'm wondering how realistic this will look when it's finished, but I think that will improve as I add more scenery, etc. 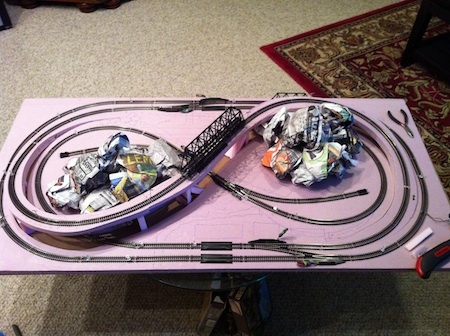 I think this would be a great project for those who don't have much space or time to put together a layout, want to get trains up and running quickly on more than just an oval, and then add details later as time permits. It will get you a pretty nice small layout in a hurry. I think I'll put this one on a coffee table. If it comes out well enough, maybe I'll take it to a train show.